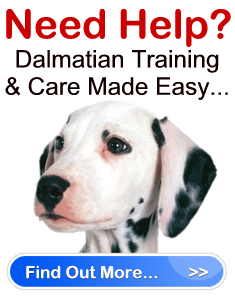 Socializing Your Dalmatian Puppy " "
Socializing your Dalmatian puppy is an important part of your dog’s development, especially before he reaches six months old. Therefore, aside from housebreaking him, one of the other lessons you will be teaching him when you bring him home is how to respond to others. Just like training, socializing your Dalmatian puppy takes time. Don’t try to rush your dog into meeting others and don’t overwhelm him. Each experience he has with a new person should be enjoyable and stress-free. Here’s how you can effectively socialize your puppy. Socializing begins with you – Before you introduce your dog to others he needs to be comfortable and happy with you. Therefore, spend plenty of time with him and lavish affection and attention on him. Introduce your puppy to children – if you have children it is important that you teach them how to interact with the Dalmatian puppy. This includes knowing how to pet, talk and play with the dog. Socialize your dog with his follow canines – Just as it is important to socialize your Dalmatian puppy with people, it is also important to socialize him with other dogs. Great places to have your dog socialize with his canine friends are at dog parks, obedience class, and with dogs owned by your friends or neighbors. Groom Him – Although Dalmatians do not require daily brushing, they still need to have their ears checked, their nails clipped and their teeth brushed. Handle his paws, ears, mouth and tail when he is tired to get him used to these sensations for future grooming. FeedHim – Make feeding your Dalmatian puppy an event. Place his dish on the floor and praise him for being a good dog as you do so. Praise him – All dogs love to be praised. This lets them know that they are pleasing their owner which is something they want very much. Praising your dog while you socialize him will help keep the socializing experience a pleasant one for your Dalmatian puppy.